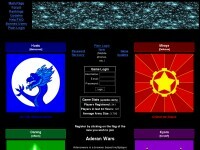 Join one of 4 races and use diplomacy or go to war to become the dominant force in the galaxy. Join or create alliances and defeat your enemies with covert or overt means. The possibilities are limitless.